Telangana State Level Police Recruitment Board, The Director General of Police, Telangana State given SI Posts 2016 recruitment notification on 6th February to fill up 510 vacancies. Applications are invited through ONLINE mode only in the prescribed proforma to be made available on WEBSITE (www.tslprb.in) at 8.00 am from 10-02-2016 to 03-03-2016 (Midnight) for recruitment to the following posts. The registered candidates may download their Hall Ticket one week before the date of Preliminary Written Test, which will be held on 17-04-2016 (Sunday) from 10.00 AM to 1.00 PM. The number of vacancies indicated is only tentative and is liable for change without giving any notice. 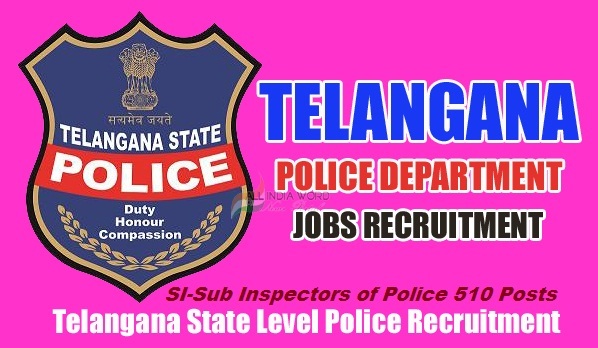 TSLPRB reserves the right to notify the modifications with regard to any aspect of recruitment during the process of recruitment.Police Jobs,Telangana State SI/Sub Inspector of Police Posts 2016 Recruitment Notification, Apply Online for 510 Posts,TSLPRB,,Online Application Form, How to Apply,Last date, Registration Fee,Eligibility Criteria, Age Limit, Educational Qualifications, Date of Exam, hall tickets, Results. The applicants belonging to OCs/BCs shall pay a fee of Rs. 500/- (Rupees five hundred only) and those belonging to SCs/STs shall pay a fee of Rs.250/- (Rupees two hundred and fifty only) towards Application Processing and Examinations.. The candidate must hold, as on 1st July, 2015, a Degree awarded by any University in India. Candidates should have age limit between 18 to 28 years as on 01-07 -2015(General).